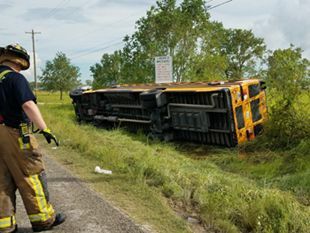 CROSBY  Bus 213 flipped on its side on Sept. 23 shortly before 2:20 p.m. on FM 1942 about 1/2 mile east of Holy Road during a driving rain. Of the 52 students and a driver aboard, seventeen aboard went to hospitals, sixteen students and the driver. At the scene HCESD#5, the ambulance service for Crosbys Coordinator of Medical Services, Christy Graves made this statement, We received a 911 call concerning a major accident with high mechanism, multiple callers. A school bus had rolled onto its side. Witnesses say the bus had swerved to avoid a collision with a car turning into a neighboring driveway. Parents were asked to wait at the Operations Center at that time. The accident is still under investigation by the Harris County Sheriffs Office Traffic Division. We are continuing to review the accident and the events thereafter to ensure that we are taking all steps necessary to protect our children. concluded Dr. Moore. 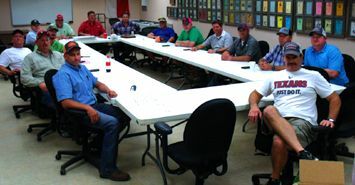 CROSBY  Each year seven seven Crosby Fair & Rodeo Board Members come up for election for three years, that make 21 Fairboard members. A director had previously stepped down and Roger Bobalik, Jr. took his post this year as a new director. During the board Meeting after the membership meeting, the Executive Board was decided by the board members. Ricky Larkin was re-elected Chairman, Sonny Armstrong is again President. Ronny Ehrlich is First Vice President. Justin George is second Vice Persident. Secretary is Eddie Glover. Rick Loggins is again treasurer. Bill Busby is again General Manager. Committees have yet to be appointed by the Executive Board but this will be decided at a later date. Earlier this week the Fairgrounds parking lot was bermed to allow better drainage. Voters are asked to go to the Goose Creek office on IH-10 to vote from all over the district to ratify a Penny Swap or Tax Swap to net Goose Creek Consolidated ISD more revenue on September 10. A Penny Swap or Tax Swap is a tax ratification election that when voted into effect raises the General Operations Tax Rate while decreasing the Debt Tax Rate by a corresponding amount. This results in no net tax rate increase for taxpayers. If approved, it would allow GCCISD to access additional state education dollars that the school district currently does not receive. said Superintendent Randal OBrien in Highlands recently. The local tax rate is $1.43 for the district, currently $1.04 M&O and $0.39 I&S currently. Thats about $1,575 per year for a $150,000 house. The change is $1.17 Maintenance and Operation and 0.26 Interest and Sinking, so no total tax rate increase. The state allows $1.50 total for a tax rate. When nearly 1/2 of all school districts in Texas sued the state due to inadequate and inequitable state funding by the 2011 State Legislature cutting $5.4 billion from the budget, it left school districts with unfairly distributed funding. The Texas Supreme Court decided that the law meets minimum constitutional requirements. Then they pointed out that local districts have discretion to raise state funding through the local tax ratification process. Goose Creek CISD wants to use the money for fine arts, Math, Science and Career Technical Education Programs, library media materials and supplies, Academic Technology and transportation. Stuff we had to cut back on recently, said OBrien. The Tax paid by individual property owners would not change. The penny swap however was said to raise an extra $7 Million for Goose Creek CISD in spite of the fact that taxes do not go up. Spending per student in Texas ranks in the bottom third of the U.S.A. On average Texas schools spend about $9,559 per pupil compared to $12,040 national average. The spending puts Texas 38th on dollars spent per pupil in the nation. Since 1990 the State of Texas is funding prisons and jails eight times faster than spending on schools. Texas has the largest disparity of any state of schools against prison funding. 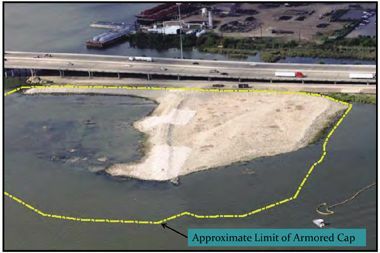 The Environmental Protection Agencys Dallas office released an anticipated study last week of the Alternatives to deal with the Toxic Waste Pits in the San Jacinto River. The study report is a 237 page volume, authored by Army Corps of Engineers from their Engineer Research and Development Center in Vicksburg, MS. The work method outlined in the report sets out to resolve 19 tasks which deal with methods of remediating the Waste Pit toxins. The study investigates the previously delineated Alternatives, known as 1N through 6N, covering no further action, or various cap-in-place solutions, or partial or total removal from the site. It also adds a 6N*, an enhanced removal plan. The advocacy group known as San Jacinto Citizens Against Pollution, with a website KEEPITCAPPED.ORG, claim that the the report justifies their position to leave the wastes where they are in the river, without removal. Their attorney, Thomas Knickerboker, categorically cites various sections of the report that say capping the site is the safest and most effective option. 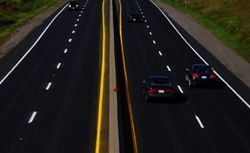 They also say the report points out that Dig-and-Haul poses risks, and that toxic chemicals could leak or be dispersed in the removal process. In the 19 tasks presented in the report, these statements are made. But the complete removal is also recommended as an alternative, if done correctly as outlined in the description. Therefore by discussing pros and cons of all seven Alternatives, it gives each contesting party opinions and facts to support their position. The escalating controversy comes at a time when the EPA is preparing to announce their draft decision on how to remediate the waste pits. This is due in the next few weeks, then the public will have a 30 day comment period, and the EPA will make the final determination by the end of December, according to EPA representative Donn Walters. In the meantime, it seems that everyone now has an opinion, and has voiced it. Congressmen Gene Green and Brian Babin have publicly called for complete removal as the only safe solution, and this was joined this week by Congressman Pete Olson. Green took to the floor of the House of Representatives last month, to urge the federal government to use the Superfund laws to hasten the removal. The Houston Chronicle is only one of a number of publications that have called for the removal of the waste pits, but it has also been printing OP-ED pieces on both sides of the issue. In July the paper ran an opinion piece by Scott Sherman, stating that the Federal Superfund program has been ineffective, and not appropriate for the problems in the San Jacinto River. Sherman was listed as an environmental consultant, having worked for the EPA, the state TCEQ, and now at the University of Houston Law Center. This piece was followed recently by an OP-ED piece by Jackie Young, who has been the leader in the resistance effort to allowing the waste pits to stay in place, with or without an improved cap. Young is deeply involved because her family once lived in Highlands, and suffered multiple health problems that they blame on polluted ground water, possibly from the waste pits. The issue of polluted well water, and the health problems related to that, was recently brought to the publics attention because the Harris County Polution Control department sampled 100 wells in Highlands, Lynchburg, and Channelview, and due to alarming results sent letters to 28 homeowners advising them not to drink their water, or to bathe or cook in it. After a retest, however, it was determined that contaminates such as dioxin and other contaminants were below the acceptable levels and the water was safe. No link was established between the wells and the waste pits in the river, it was noted, too. Among the government voices having an educated opinion on the subject of removal, was Mike Talbott, the retiring head of the Harris County Flood Control District. Talbotts remarks included the highly toxic waste at the site, in this major rivers floodway, and subject to extreme force of flood flow, tides and storm suge, should not be allowed to remain there. These remarks, calling for complete removal of the toxic wastes, follows closely the position that advocate Young has taken. In summary, the Corps of Engineers report seems to favor leaving the waste pits in place, but rebuilding them with an improved cap, and pilings to fend off barge strikes. They also would need a number of Institutional Controls to assure future compliance. Their detailed mathematical analysis indicates that complete removal would release much more of the toxins into the soil, the ground, and the water. However, the report optimistically indicates that removal could be safely accomplished, if the contractor followed Best Management Practices, proceeding with techniques that would minimize releases. 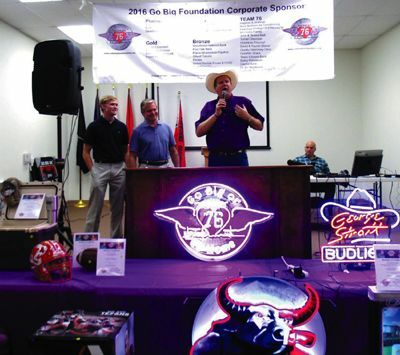 CROSBY  The Cody Stephens Go Big Or Go Home Memorial Fundraiser last Saturday brought out some of the best in northeast Harris County in charitable people and concern for saving young lives. 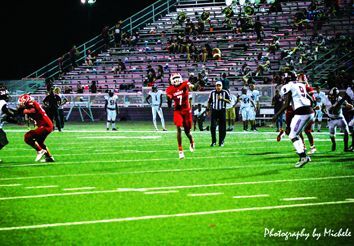 Crosby Fair & Rodeo, Rotarians, Chamber of Commerce board and varied other groups had members in support of this effort to raise funds for adding an ECG with sports physicals in students across the State of Texas. In total 408 attended the event. Sudden cardiac arrest is the number 1 killer of our student athletes beyond accidents. Many can be found before they suffer and arrest by a simple ECG. said Scott Stephens. The Cody Stephens Go Big Or Go Home Memorial Fund paid to screen 8,000 students last school year and found 2% had an issue they needed to know about and 9 that were at high risk of sudden cardiac arrest. Nine young lives were found at risk that would not have been found by the question and listen method currently done by the U.I.L. mandate. With the money raised last Saturday the Memorial will be able to continue the expansion of this program across the State of Texas. We are still taking donations through the website codystephensfoundation.org and are a 501(c)3 organization. continued Stephens. The fundraiser got $71,000 in corporate sponsors, $65,000 from live auction featuring both Bill Busby and Ricky Loggins as auctioneers. The silent auction brought in $6,000. grossed about $150,000 and will net around $125,000. The goal is simple, screen em all. concluded Stephens.